Bosch 18V Cordless Li-Ion 4-1/2 in. Angle Grinder GWS18V-45 New CANADIAN SELLER! 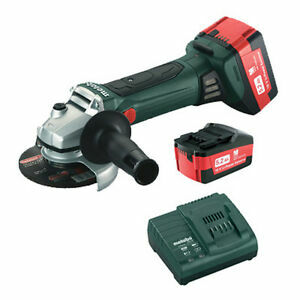 MPN: LTX-115 (602170530) Wheel Diameter: 4-1/2"
Metabo W18 LTX-115 is a very good product,.The batteries expecially awesome. The only thing I don't like is the switch placement, which can be very dangerous when using 6" slicer wheels: Your fingers must rest within 1cm of the blade edge, gloves required! Metabo WPB18 has a much safer trigger design, but it costs almost $60 more per unit, and its trigger cannot lock closed, which is sometimes useful. It's good to have both types of grinder. I needed to remove some paint and I chose a cold day because paint is easier to remove in these conditions. This tool held a charge for about two hours of constant use in 30 degree weather. It also was easy to manipulate because the battery pack can be turned in the event of an impedance for easy of use. I doubted that this would have the power necessary to rely on it to do the job - I was mistaken!. I have 4 corded Metabo grinders in this size range that are truly impressive. This grinder is comparable in every way to those grinders for power, balance, handling. Set up with a thin slicer disc it is so convenient. The battery charged fast enough and now it is my go-to grinder for all those quick tasks.